CBAP (CSAP) is bringing you an analytical view of Iranian changer and revolutionary clergy man Ruhollah Al-Musawi Al-Khomeini, founder of the one of the most crucial revolution in the Middle East region. The aim of this analysis is to describe his background and life as well as to analyze his behavior, attitude, appearances and speeches from the discourse of the cult of personality and the ideology which he has represented. Ruhollah Al-Musawi Al-Khomeini) was born in 24th of September 1902, in Khomeini, a smaller town in central province of Iran. His family was well educated and trained in theology, which predestinated Imam Khomeini to the religious attitude, thinking and behavior. He was interested not only in religion, but also in other sciences such as mathematics, astrology or philosophy. According to his well-educated personality and greatly diverse knowledge and a wide world-view, he was recognized as one of the teachers of philosophy and theology. His ascetics, chastity and devotion were exemplary to the elites of the society. He considered gaining the pleasure of God and fulfillment of duty as the main aspects of his moves and conducts. During the 1960’s he became leader of the clergy in Iran. His leadership and all his slogans and mottos related to his ideology and movement were marked as a new chapter of the Iranian history. Due to the fact that his lectures and thoughts were against Iranian government, he was forced to close his courses and lessons that caused disrespecting behavior and acting of the government and potentially meant risk for the social stability. But even though he was forced to leave his home country, he still was able to write his testaments, thesis and books to spread his thoughts and ideology among all social classes in Iran. According to the completely different mindset of the political elites and clergy, he was persecuted and forced to emigrate. The first place was Turkey, where he could stay just few weeks. In a hope of a better place, he was set to Iraq, where the pressure of Iran was stronger than he expected. The last place and maybe the decisive one was Paris. From there he shared his mindset across the Europe to the Middle East and to Iran particularly. His books and thesis were strictly forbidden, but they were more and more frequent, especially in student community and underground society. Considering the unstable situation in government and generally in Iran caused by Khomeini’s writings and his thoughts, he came back to Iran in 1979 to finish his Islamic revolution and to change the history of Iran forever. Almost two million of people were waiting for him in the airport in Tehran. Imam Khomeini has become historically one of the most adored icons of Muslim world. For one part of the world community he represented revolution, courage, loyalty and faith. For the other part of the world, he has been Islamic fanatic, dictator and denier of human rights. His decision to implement Islamic codex of behavior and rules and norms of Sharia Law was the ultimate act completing the change and re-structure of the society and citizens in Iran. It has influenced general rules for behavior between women and men, but also rules for education, publishing magazines or newspaper, or TV and radio broadcasting. These norms, censorship and foreign policy, which have been strictly against western states, especially the United States, still exist. His development of the theocratic state, particularly theocratic republic, which is something apart from all ordinarily, caused that other states turned away from Iran. If we focus on today situation, the Iranian view of Imam Ruhollah Khomeini is a little bit complicated and diverse. Old generation, generation which took part of this enormous and unbelievable moment of Islamic fundamentalism, still sees this man as the protector, lifeguard and honest clergyman, who established Iran how it is known today. They are thankful for being in one of the most stable states in the region. On the other hand, the younger generation, which did not experience it, considers this revolution and Imam Khomeini just as a part of their history. This generation does not see the revolution as something from which they can take benefits. However, during celebrations or special occasions we can still see not only pictures and photos of the actual clergyman and president, but also pictures of Imam Khomeini, who is still symbol of Iran. Foreign view of Iran and Imam Khomeini is quite diverse as well. Muslims states see the Islamic Republic of Iran as a potential inspiration. However, it is necessary to mention that Iranian Islamic system is different from systems of other countries such as Saudi Arabia, United Arab Emirates or Afghanistan. In contrary, current rules in Iran allowed for instance women to drive a car, work with men or to study whatever subject they want to. The affection of Iran by Shia Islam and by Ayatollah Khomeini is now causing clash with Saudi Arabia due to the executions of Shia clergy men there. Imam Khomeini represented believer of religion fundamentalism. This ideology was mainly established from the beginning of the 20th century. The religious fundamentalism focuses on refusing differences between politics, policy and religion. On the other hand, it is based on dividing private sector from the public one. This kind of fundamentalism is particular kind of thoughts in which principles are principles of the ultimate truth and which are pure interpretation of the Holly texts and not deconstructing. Imam Khomeini was focused just on the Islamic Fundamentalism. The main aspects that caused rising of this ideology were not only globalization and decolonization during the second half of the 20th century, but also secularization. Moreover, it was also national boundaries that demarcate the Middle East today, which were the result of negotiation and back-door dealings between the Great Powers in the nineteenth century. Islamic fundamentalism means generally intensively experienced faith of Islamic principles of living and moral aspects. It is meant to establish Islamic State, but not in today meaning of Islamic State, but basically to develop a state, which would be based on Islamic law. It has been meant as a theocratic state, where the clergy should govern the state. One of the main principles of this faith and ideology is to practice law called Sharia. This law was developed between ninth and fourteenth century and represents status quo of rules strict codex of the only right behavior, which collects punishments or individual rules for men and women. Even though these rules are from the ancient time, it is still used as the primary law. The Islamic Revolution caused by Imam Khomeini in 1979 was crucial historical point or milestone of this religious ideology. From that moment, Islamic fundamentalism enrolled a huge ascendant. This was unprecedented development which brought Islam from the shadow and showed how powerful this religion actually is. Imam Khomeini came with this ideology and thoughts during the 1940’s, when he came up with the idea of institutionalized government of clergy men and of establishing Islamic Republic of Iran, which in this mean does not make sense, because the republic has to include signs of democracy. He handled this idea as a goal to re-establish Islamic world and set it free from the occupants as the United States or other western states were perceived. This ideology implicated to the Iran and Imam Ruhollah Khomeini, who presented these thoughts throughout the new norms and rules of political, but also social life, which impacted citizens the most. For instance, women and men cannot be together alone without being married. The most common rules and mostly discussed rules are these related to clothing. Women are not allowed to go out without a headscarf. It is also forbidden to show hands, decolt or legs. In his speeches and messages, he always showed the importance of Islam as the religion and the necessity to abide these rules that are written in the Divine Law and the Koran. In every paragraph he mentioned something, which was emotionally colored in order to explore more of him and of his behavior. These signs of emotional involvement helped him to find more potential listeners who would follow him, who would follow his words and thoughts just because of these emotional expressions. He showed his feeling and opened himself to others to convince them he was there just for us, just for their country. His promises and prediction of practical solutions of that situation caused that his followers started to believe that he would be the only one, who might be able to change the political system. His writings were more and more frequent and even though he was persecuted and set out to the exile, he was able to prepare and establish this Islamic revolution without being in the state. Until now, this revolution has been the unprecedented event in the history of the region. Furthermore, Islamic republic of Iran still exists as potentially the most politically and socially stable state in the Middle East. On the other hand, the focus might be also on the political signs on his speeches. He was frustrated of the Iranian government and of the reigning dynasty, who left the United States “occupied” their country. He stressed out this relationship between Iran and the United States, who were considered as the potential enemy. He introduced his ideas and thoughts of the possibilities how to avoid or discontinue this relationship and how to stop its further development. He assumed that this specific relationship is potential danger not only for the state, but also for the citizens within the state. In his eyes, the United States were different community with completely different and more diverse culture and history. This actor represented annihilator of Iranian culture, life and sovereignty. Imam Ruhollah Khomeini invocated all citizens in Iran, especially students, scholars and academics to raise their minds, to show their positions and thoughts and to follow the God and his will. He called for attention of everyone to avoid doing things or activities that would be possibly against the Divine Law. He called for affiliation of other Muslim to the community. Although Imam Khomeini was Shia Muslim, he exhorted to pray together with Sunnis Muslims. During all his appearances and especially after the 1979, he wished happiness and victory to all believers. He prayed for people who were discredited or injured during the revolution and advised everyone to help him not only mentally, but also financially. It means that he showed his involvement in it, he showed that his people and his followers are the most important for him. He also prayed for the magnitude of Islam and of new Islamic world. He showed that the Iranian revolution and the new Islamic Republic of Iran was his sense of living. Imam Ruhollah Al- Musawi Al-Khomeini, who experienced both World Wars, has been one of the most influential people of 20th, but also 21st century even after his death. His political ideology and view of the Islamic society allowed him to spread his thought and ideas of the Iranian existence. He was strong believer of Islamic fundamentalism, the ideology, which was developed during the 20th century, especially in the second half. This religious ideology helped him to rise up the Islamic community not only in Iran, and established new political system, which has been built on these values. His emotional parts in every speech or appearance, his attitude and strong religious rhetoric made him the Persian defender and protector of Persian history, culture and Islamic religion. Even after his death, most of Iranian society and of the Middle Eastern society draw from his thoughts, ideology and ideas. His willingness to help Iranian people and to free them from Western influence, and his ability to target youth in Iran helped him to start and complete one of the biggest revolutions so far. Akbarzadeh, S. and Collective (2012) Routledge Handbook of Political Islam. New York: Routledge. Axworthy, M. (2008). Dějiny Íránu. Praha: Lidové noviny. Beránek, O. a kol. (2011). Iran: Between Power and Civil Society. Praha: Metropolitní univerzita. Hamid, A. (1994). The Narrative of Awakening. Tehran: The institute for compilation and publication of the works of Imam Khomeini. Heywood, A. (2008). Political Ideology. Plzen: Nakladatelství Aleš Čeněk. Tureček, B. (2013). Labyrintem Íránu. Praha: Knižní klub. Falk, R. (2014). 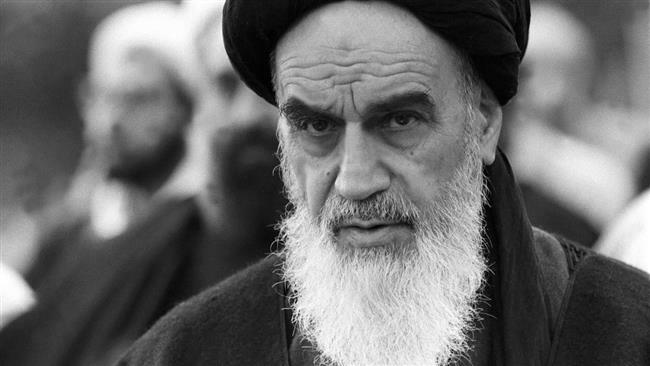 Ayatollah Khomeini: A rare encounter with a true revolutionary, Al Jazeera online, available online at: https://www.aljazeera.com/indepth/opinion/2014/02/ayatollah-khomeini-rare-encounte-20142354756879470.html.